The Connecticut State Grange has created this website policy statement to demonstrate our organization's commitment to your privacy. The type of information received about you depends entirely on how you use the website. Outlined below are the various methods of information collection and how this information is utilized within the Connecticut State Grange Organization, including but not limited to it's various Subordinate Granges located across the State. Your use of this website is subject to these terms and conditions. By accessing this website, you agree to be bound by these terms and conditions. Your privacy is important to us. To better protect your privacy we provide this notice explaining our online information practices and the choices you can make about the way your information is collected and used. To make this notice easy to find, we make it available on throughout our website, including but not limited to our homepage and on every page where personally identifiable information may be requested. The Connecticut State Grange's website is provided for informational, education, archival and entertainment purposes only. The Connecticut State Grange's website collects certain information from and about its users in three ways: directly from our Web Server logs, the user, and with Cookies. This information is utilized solely for the purpose of conducting business, sharing information and providing online services. To prevent unauthorized access, maintain data accuracy, and ensure the correct use of information, we have put in place appropriate physical, electronic, and managerial procedures to safeguard and secure the information we collect online. • Pages and documents you viewed on the site and downloaded from the site. The Connecticut State Grange's website reserves the right to share aggregated site statistics with partner companies, but does not allow other companies to place cookies on our website unless there is a temporary, overriding customer value (such as merging into www.CTStateGrange.org a site that relies on third-party cookies). Visitors to our website can register for services to enhance their visit. Such services include but are not limited to the MyGrange service and Mailing Lists. Upon registration, personal information such as name, address, e-mail address, telephone number, and other relevant information may be requested. You may also be asked to disclose personal information to us so that we can provide assistance and information to you. For example, such data may be warranted in order to provide online technical support and troubleshooting. • In connection with a merger, acquisition, or liquidation of the organization. The Connecticut State Grange website pages may contain electronic images known as Web beacons (sometimes referred to as single-pixel gifs) that allow Connecticut State Grange website to count users who have visited those pages and to deliver co-branded services. Connecticut State Grange website may include Web beacons in promotional e-mail messages or newsletters in order to determine whether messages have been opened and acted upon. Some of these Web beacons may be placed by third party service providers to help determine the effectiveness of our promotional campaigns or email communications. These Web beacons may be used by these service providers to place a persistent cookie on your computer. This allows the service provider to recognize your computer each time you visit certain pages or e-mails and compile anonymous information in relation to those page views, which in turn enables us and our service providers to learn which advertisements and emails bring you to our website and how you use the site. The Connecticut State Grange website prohibits Web beacons from being used to collect or access personal information. The Connecticut State Grange does not collect or maintain any information from individuals under the age of 13 in order to protect their privacy. The website is of general content in nature and is not directed specifically to children in this age group. The Connecticut State Grange encourages all parents to assist their children with accessing information via the web. The Connecticut State Grange website contains links to other Internet websites. 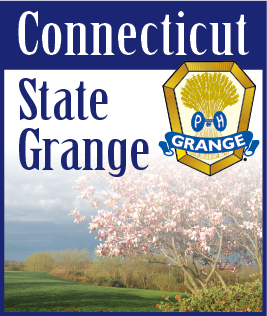 The Connecticut State Grange is not responsible for privacy practices of any linked sites, including but not limited to corporate sponsors of the organization, resource sites not affiliated with The Connecticut State Grange, and any state, chapter, or individual member's websites linked from The Connecticut State Grange online resources. No warning will be issued when a visitor has accessed a link to a website outside the realm of The Connecticut State Grange website, but every effort is made to standardize the look and characteristics of all pages within The Connecticut State Grange website itself. The Connecticut State Grange website, and it's hosting provider, has appropriate security measures in place at the physical facilities where the information resides, to protect against the loss, misuse or alteration of information that is collected from you at our site. All of the information on this site is presented in good faith and believed to be correct. However, The Connecticut State Grange makes no representations or warranties as to the completeness or accuracy of this information. From time to time, information may be used for new, unanticipated uses not previously disclosed in the privacy notice. If our information practices change at some time in the future those changes will be posted to The Connecticut State Grange Website to notify you of these changes and provide you with the ability to opt out of these new uses. If you are concerned about how your information is used, you should periodically check the Web site and it's notices. All content within this website, including but not limited to text, data, images, audio and video clips, are the property of the The Connecticut State Grange, its licensors, content suppliers and/or syndicates, and is protected by U.S. and international copyright laws. By nature of this website's "Content Management" tools, third parties may have an ability to post information, graphics, etc., within. If you find any item posted that is deemed to be infringing on a copyright, please submit a request for removal through the contact information listed above. The Connecticut State Grange reserves the right to change this website and the content as described therein at any time. The Connecticut State Grange complies with their obligations under the Data Protection Act 1988 and the Data Protection (Amendment) Act 2003. The Connecticut State Grange website was developed in the United States of America in accordance with and shall be governed by, and your accessing and using of the Site shall be deemed acceptance of the laws of the state of Connecticut, United States of America, with the exception of that body of law referred to as conflicts of law, as well as consent that any legal action or proceeding between The Connecticut State Grange and you arising out of your accessing and use of this website shall be brought exclusively in a federal or state court of competent jurisdiction sitting in Connecticut. All trademarks, brands, names and logos appearing on this web site are the property of their respective owners. The Connecticut State Grange and Granges held under it's jurisdiction, as a subsidiary of the National Grange, has authorization and approval to use the GRANGE trademark. National Grange is the owner of the U.S. Trademark Registrations for a variety of GRANGE Trademarks including GRANGE (U.S. Registration No. 1,872,429), NATIONAL GRANGE (U.S. Registration No. 1,817,984), NATIONAL GRANGE OF THE ORDER OF PATRONS OF HUSBANDRY (U.S. Registration No. 1,816,827), and the Grange Logo (U.S. Registration No. 1,824,368), and has been using its GRANGE mark since 1876 in connection with a variety of goods and service. National Grange has local, county and state locations throughout the United States. The Connecticut State Grange has partnered with and thus authorized SkullCo Technology Solutions and Purple Fusion Graphics to design, develop, program and host it's websites. By using this Website, you agree that The Connecticut State Grange, SkullCo Technology Solutions, Purple Fusion Graphics and and all other third-party vendors associated with this website shall not be liable for any damages resulting from the use or misuse of the the following, including but not limited to software, systems, design, text, graphics, online hosting services, e-mail services, support services, information or related systems provided on this Website. Neither The Connecticut State Grange, its authorized partners, its owners, its officers, its members, its affiliates, its associates, nor any agency thereof, nor any of their employees, makes any warranty, express or implied, or assumes any legal liability or responsibility for the accuracy, completeness, timeliness or usefulness of said website and system, including any information, output, client experience or unspecified services related to said website and system. Information provided is not intended to provide sole or conclusive direction, input or data for any purchasing or usage decision on behalf of The Connecticut State Grange, nor its visitors, patrons, members, clients, employees, staff, contractors, owners, investors, agents, assigns, successors or affiliates, now or in the future. You agree to indemnify and hold harmless The Connecticut State Grange, its authorized partners, its owners, its officers, its members, its affiliates, its associates, nor any agency thereof, from liability of any sort in connection with the contents of said website, its verbal presentation or any actions taken based on information presented herein. THIS WEBSITE AND THE INFORMATION, SERVICES, PRODUCTS AND MATERIALS CONTAINED ON THIS WEBSITE ARE PROVIDED ON AN "AS IS" BASIS WITH NO WARRANTY. TO THE MAXIMUM EXTENT PERMITTED BY APPLICABLE LAW. THE CONNECTICUT STATE GRANGE AND ITS AFFILIATES DISCLAIM ALL REPRESENTATIONS AND WARRANTIES, EXPRESS OR IMPLIED, AS TO THE OPERATION OF THE WEBSITE AND THE INFORMATION, SERVICES, PRODUCTS AND MATERIALS ON THIS WEBSITE, INCLUDING, BUT NOT LIMITED TO, ANY WARRANTIES OF MERCHANTABILITY OR FITNESS FOR A PARTICULAR PURPOSE. IN NO EVENT WILL THE CONNECTICUT STATE GRANGE AND IT AFFILIATES BE LIABLE FOR DAMAGES OF ANY KIND ARISING FROM THE USE OF THIS WEBSITE OR ANY INFORMATION, GOODS, OR SERVICES OBTAINED ON THIS WEBSITE, INCLUDING DIRECT, INDIRECT, CONSEQUENTIAL, INCIDENTAL, SPECIAL OR PUNITIVE DAMAGES (EVEN IF THE CONNECTICUT STATE GRANGE AND/OR ITS AFFILIATES HAVE BEEN ADVISED ON THE POSSIBILITY OF SUCH DAMAGES), TO THE FULLEST EXTENT PERMITTED BY LAW. INCLUSION OF ANY COMPANY NAME (WHETHER IT IS PROTECTED BY TRADEMARK OR NOT) ON THIS WEBSITE DOES NOT IMPLY ENDORSEMENT AND IS MERELY A FACTUAL STATEMENT OF PURCHASE, REGISTRATION, OR EXPRESSED USAGE, IN WRITING OR VERBALLY THEREOF.